Currently viewing the tag: "opinion"
You think I’m going to be all old school about this Lance Armstrong thing — it’s about the fairness of competition and the lying, blah blah blah? Well, I’m not. Lance Armstrong is a win-or-die sociopath freak show, without a doubt, but I’m over the hypocrisy of outmoded laws of competition that prohibit the use of steroids. It’s been pervasive in sports for more than a quarter of a century, starting with Arnold and his Mr. Universe days. Everyone keeps it on the down-low because it’s illegal in professional competition, but everyone, EVERYONE, is doing it. Why don’t we just come out with it already? Imagine the data to be gleaned with the truth of its use. We’d have twenty-five years of “lab mice” to examine, and that’s just the retired NFL players! I purchased a series of B-12 injections from Groupon last year and ended up at a hormone and steroid dispensary disquised as a weight-loss, health clinic. There was a lot of we offer Human Growth Hormone, with a description of eternal life and wink. There were signed framed pictures of famous people and athletes on the wall. “How do you think they stay so young looking,” the practitioner said, and gave me a fistful departing literature with a price-list that went into the thousands. The side-effects? Once you end the “therapy” you turn to dust as quick as the portrait of Dorian Gray converts into a nightmare. The continuance of the drugs demanded forever, until death do you part. Sounds like a deal with the Devil, huh? Well, Lance Armstrong made it, as did all those busted Olympians, the football and baseball players, the body builders who now look like disintegrating negatives of themselves, all loose-skinned and craggy. I hate the hypocrisy. This whole Lance Armstrong scandal may finally rattle the cages of professional sports enough to cause them to embrace the truth and use steroids for what we all really want — some mutant Gladiators to entertain us blood-thirsty Romans before the fall. At the very least, let’s get some FDA approval and legal research going so I can have supple skin and toned muscles on the cheap into my next century of life. 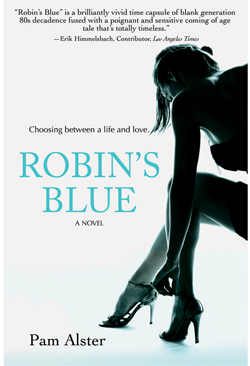 Pam Alster, former stand-up comedienne, Lifetime TV writer & suburban mom brings a decade of living on the dark side to light in her novel debut Robin’s Blue available everywhere November 1st. www.pamalster.com Find her on Facebook and Twitter @plexigirl.